This place is close to the I15, but hard to find, if tat makes sense. Eardly is a long canyon that parallels the freeway, but hard to find the right little dirt roads that get you right to the canyon. Anyway, Eardly is fun mostly for some big "keeper" potholes. For those who don't know, potholes are deep pools that hold water even when the desert around has been dry and hot, even sometimes for years. The fun is plunging into that cold water from a hot dusty dry hike. It is refreshing and exhilarating. 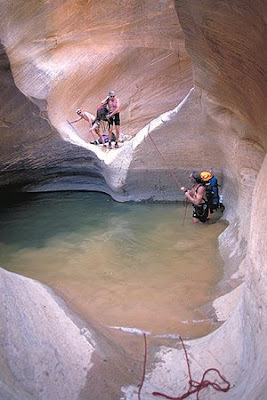 An added thrill is that some of the deeper pools won't let loose of you too ease. They are the "keepers". Sometimes it takes a rope to scale up the other side. Don't try any climbing without experienced help! Promise me you won't try. There's lot's of peple who will be glad to take you out to a "keeper" for a trial run. I did most of the slot canyon hiking in the winter, when the pothles were stiff, or else I hiked the long way round the rim, which can have it's own hazards. In any case I was taking the risk by myself, not putting others at risk. Alway be safe! Safety first! Got it. With the kids, we'll probably skip the really hard ones for now.